My first ever ceviche experience is through the Travel Channel. Every time Anthony Bourdain or Andrew Zimmern travel to any places near water, they always get to eat the most amazing ceviche. Yes I know we can't possibly experience what they experience with their taste buds but it was still a beautiful experience with my eyes. The Midwest is probably the last place you would ever find ceviche but I lucked out. I went to lunch with a friend at this Peruvian restaurant in a shady area of town. Yelp boast it was the best ceviche in town but I took it with a grain of salt, we do live in corn country after all. The ceviche arrived on a huge plate, and still the shrimp, squid, and fish were spilling every where. I knew I would love it just by looking at it and I did! It was so amazing, I can't imagine how even more amazing it would be to have ceviche made fresh right out of the water. 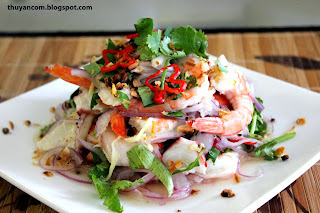 I wanted to recreate the ceviche I had but of course with a Vietnamese twist. This is a great dish to beat the summer heat, enjoy! 1. 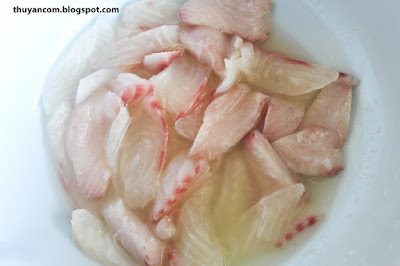 Cut the tilapia into flat pieces. 2. Squeeze enough lime to cover the fish and let the fish cook in the lime juice. 3. 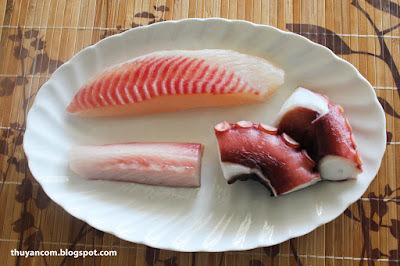 Thinly sliced the octopus. 4. 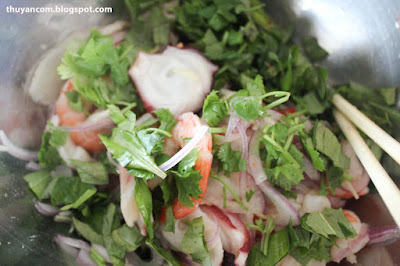 Add the octopus and shrimp to the lime juice with the fish. 5. Drain about half of the lime juice from the seafood mixture. 7. Add the sliced onions and pepper, toss thoroughly. 8. Right before serving add the cilantro and coriander. 9. Top off with peanuts and shallots. This looks yummy. Since I live on the gulf coast I will try this. I haven't had ceviche since visiting Mexico many years ago. I know I will like your recipe. Thank you. “Nice Post. It’s really a very good article. I noticed all your important points. Thanks"
This looks yummy. Since I live on the gulf coast I will try this. I haven't had ceviche since visiting Mexico many years ago. I know I will like your recipe.to know about bay area bankruptcy lawyers please visit our site. Really nice article and by reading this article i learned somethings.To know about bay area bankruptcy lawyers please visit our site. This is looking awesome and hope I will follow this blog everyday. Looks so delicious.I would really like to test them.Thanks for sharing recipes. I really enjoyed what you had to say. Keep going because you definitely bring a new voice to this subject. Not many people would say what youve said and still make it interesting. Well, at least Im interested. Cant wait to see more of this from you. Some follow their heart, I follow my stomach.